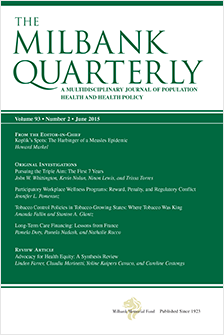 The Milbank Memorial Fund has published The Milbank Quarterly, a peer-reviewed journal of population health and health policy since 1923. It has commissioned and published reports since early in the last century and, beginning in the early 1990s, published a series called Milbank Reports. The Fund also publishes Issue Briefs and Milbank-Supported Reports. From 1999 to 2013, the Fund co-published with the University of California Press a series of books titled California/Milbank Books on Health and the Public.